Location: The house is set in wooded grounds about 150m S of Llanbedrog church, and facing E to Cardigan Bay and Snowdonia over a front lawn. Built in 1856-7 (date in stained glass of the porch chamber) as dower house for Elizabeth (Caldecot), the widow of Sir Love Jones Parry of Madryn Castle. It was designed by Henry Kennedy, architect, with an Irish partner, partly to house the family collection of fine art. Lady Elizabeth died in 1883. It was bought for £7000 in 1896 by Solomon and F E Andrews, the Cardiff entrepreneurs who promoted and developed the W end of Pwllheli as a holiday resort. He provided a horse tramway to link the house with Pwllheli, and further developed the house as a public art gallery with tea rooms and ornamental gardens. It was sold again c1946, to Dafydd and Gwyneth ap Tomas who carried out some restoration. Since the 1970s the house has become once again an arts centre and gallery. 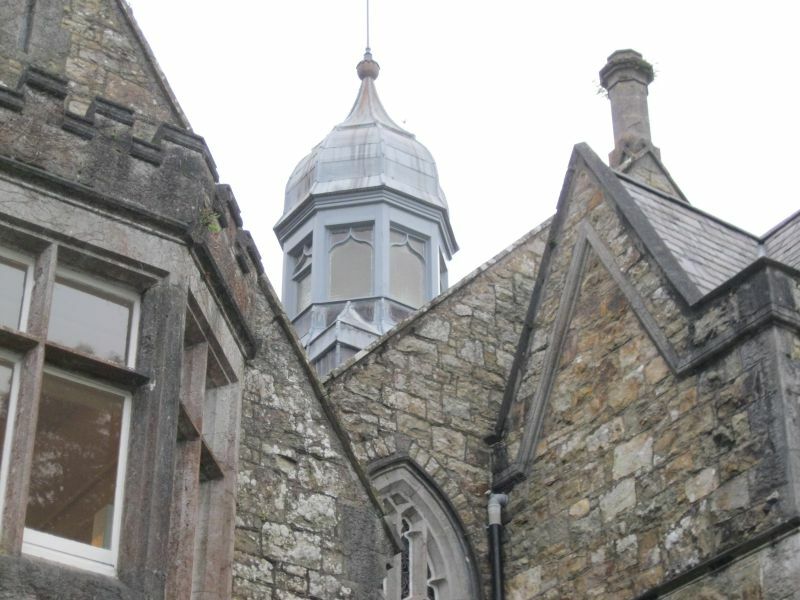 Built in a Victorian high Gothic style, of snecked brown stone, with steep slate roofs and prominent stone chimneys with tall square brick shafts linked at the heads. Two storeys, an irregular E-plan with a rear wing containing service quarters. The entrance front faces east and consists of 3 principal gabled bays, the centre with a 2-storey gabled porch, gables also to its corbelled sides. Double-leaf panelled doors set in a square headed Tudor moulded arch, and above, a large 3-light Perpendicular window to the upper floor chamber. The inner doorway is also arched. The porch bay is flanked by narrow recessed bays; part of a large gable behind the porch. These recessed sides have further 2-light Perpendicular windows on the first floor, 2-light mullion and transom windows to the ground floor. The end wings are also gabled, that to L has a 2-storey canted bay window with crenellations and mullion and transom windows. The right bay has a first floor oriel window corbelled out over a 5-light mullion and transom window on the ground floor. Lighting the centre of house is an elaborate octagonal timber lantern with a bulbous lead dome. The S elevation has a restored conservatory in front of a gable with a chimney at the apex, and a dormer window to the right. The N elevation has a tall external shouldered chimney, and, to its right, a 2-window gable with mullion and transom windows to the first floor, 3-light windows to ground floor. To the right of this, a Tudor-headed doorway with quatrefoil above, and a small first floor window. To rear of the house, a lower 2-storey block at right angles with small-pane sash glazing. Further to the rear, a block with gable facing N; 2 windows, mullion and transom windows to first floor, 12-pane sashes to ground floor. Behind this at right angles, 3-window block with small-pane sash glazing. At right angles to this, single storey attached range of 7 timber windows with leaded glass and a door, altered. The entrance leads through a remarkable Chinese-style inlayed walnut veneered inner lobby, embellished with fine crest decoration. Immense lofty hall, its roof carried on close-spaced hammer beam roof trusses whose pendants have heraldic shields. At the centre a grand flight of stairs rises, dividing at the half-landing and continuing up to a gallery around the full circumference of hall; the balustrade with pinnacled newel posts, and cusped Gothic tracery in iron. The whole of the gallery is supported on corbelled hammer-beams. At head of stairs a large 3-light Perpendicular-style stained glass window with heraldic shields relating to past owners of the house. At front of gallery, a tripartite glazed Gothic screen opens to the upper room of the porch. The Hall has a polychrome tiled floor; and a diminutive stone medieval-style fireplace with a roundel containing the initials EJP. The rooms opening off both hall and gallery have Tudor doorheads with panelled doors and deep panelled jambs. The main ground floor room on the right has a ladder cornice, central rosette, and arch feature on the end wall. The room on the left has a fine Carrara marble fireplace with honeysuckle painted panels and an iron grate. Ceiling rose and Gothic cornice. The front window has a columnar frame. A Perpendicular style window-door opens to the conservatory, which has been restored. The service rooms to the rear include a high servants hall with a large stone fireplace. Graded II* as a major domestic work of the architect Henry Kennedy, and a remarkably complete and ambitious art gallery with added interest from its connections with Solomon Andrews, an important figure in the history of the development of the Lleyn coast in the C19. The church is located on the first level ground above the beach, at the lower end of Llanbedrog, and close to the small stream with defines the churchyard on the SE. St Pedrog's church is in the lower centre of Llanbedrog. The lychgate provides the access to the churchyard from the road on the NE side of the churchyard. The house stands in the angle between Ffordd-y-traeth and Pentre Llan, at the lower end of Llanbedrog. The building is located immediately above high tide level at the W end of Llanbedrog beach, below Trwyn Llanbedrog. The milestone stands on the N side of the main road, immediately W of the junction of the B4413 Aberdaron road, at the centre of Llanbedrog. The well is in a small defile running up from the main Abersoch road, c200m W of the centre of Llanbedrog. The cottage is set in the angle between two minor roads winding around the SW side of Mynydd Tir-y-cwmwd. The chapel stands back from the road at the top of a sloping forecourt, bound on both sides by buildings.